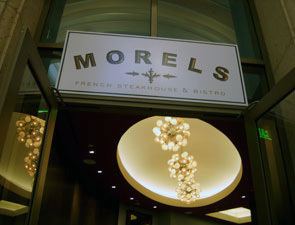 Situated inside the $1.8 billion Palazzo -- a Las Vegas hotel-casino-resort like no other -- Morels is the love child of Los Angeles restaurateurs Sal Casola and Chipper Pastron. 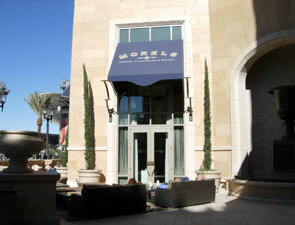 The first of 14 restaurants to open at the Palazzo, it also is one of the best. Designed by Ralph Gentile, the restaurant boasts comfortable patio dining overlooking the Strip, two private dining rooms and several bars -- only one of which is for cocktails! There's an iced seafood bar, for instance, and a cheese and charcuterie bar, as well as a windowed wine cellar with more than 400 varieties of wine inside it. Of course, there also is a beautiful dining room with Murano glass chandeliers and floor-to-ceiling glass doors that lead to the patio. And if that isn't enough, the attention to detail is phenomenal. You'll feel as if you've stepped off the plane and into post-war Paris, far away from modern-day Las Vegas. Not to fear, though: You are still in the culinary capital of the modern world. And while the atmosphere is pure Paris, the food is Las Vegas at its best.